When you think of food for Hanukkah, you think of latkes. Passover? Matzo balls. Shavuot? Shavuot is all about dairy products - cheese borekas, cheese blintzes, cheese danishes, and most importantly and quintessentially: cheesecake. I grew up hating cheesecake. I always thought it was too dense, and too often topped with horrible gloopy, canned, and not-good-tasting cherries. Then I tried my stepmother’s cheesecake, and it was unlike any other I had ever had. It was delicate with a light crust, and it had a thin layer of a cheesecake-like mixture that got topped with loads of fresh raspberries. It wasn’t too rich or too sweet, and the fresh fruit was the perfect compliment to the creamy filling. 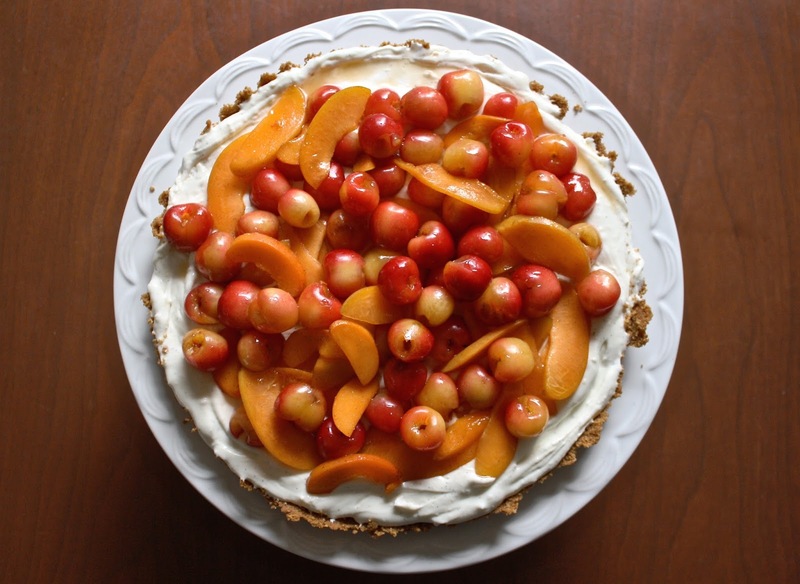 Inspired by her’s, this recipe is akin to a no-bake cheesecake that you can top with any seasonal stone fruit or berry. Cherry season is short, and I want to take advantage of every second of it. Apricots pop up at the same time at the market, and both fruits are sweet and tart, complimentary in color, and equally complimentary in taste. I keep the fruit fresh on this tart, which also makes this dessert simple to put together, and easy to whip up in advance. A few notes: the no-bake filling means that this is looser than any kind of traditional cheesecake. If you really want to use cherries and they’re not available, thawed frozen ones will work. I use vanilla bean in both the filling and to macerate the fruit; the vanilla flavor is more pronounced when the seeds come scraped out of the bean, but you can substitute with good quality vanilla extract instead. 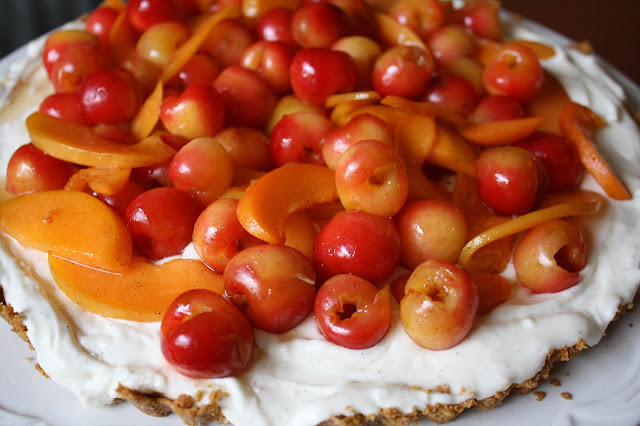 Also, I use Luxardo (Italian cherry liqueur) in both the filling and to macerate the fruit. It adds a note of complexity and booziness, and enhances the natural flavors in the cherries and apricots. If you don’t have a cherry liqueur or brandy on hand, you can substitute with other liqueurs (Amaretto, Cointreau, Chambord) or even a good bourbon. A splash of almond extract could work well, too. You can also skip that step entirely and the fruit and filling will still taste delicious. Preheat the oven to 350°F. (You can also skip baking the graham cracker crust - it will set well enough when it is refrigerated).